Too much screen time is a constant worry, especially if you have kids. Osmo is a groundbreaking way to blend digital learning with the physical world. Via a special reflector that you place over your iPad’s camera, Osmo sees what’s happening in front of it. This bridges kids’ real-world actions with games that they can play solo or in groups. Make a shape with Tangram puzzle pieces and Osmo will celebrate when you get it right. Have a word-guessing competition with real-life tiles. Let Osmo help you draw any picture by turning photos into a set of lines for you to trace on paper. Even learn some physics by using anything—a pen, a toy, a pair of glasses—to guide balls on the screen into targeted zones. Founders Pramod Sharma and Jérôme Scholler are two dads who used to work at Google. They wanted their kids to embrace technology, but in a way that fosters creative thinking and interacts with the real world. Osmo’s games all work with free apps, and the physical pieces (for Tangrams and Word games) are included. As Osmo continues to grow, they’ll be adding new apps, too. Teach kids to embrace technology as a tool and to integrate it into the bigger picture of everyday play. Hello everyone! I'm proud to introduce Osmo to The Grommet. I'd be happy to answer any questions you have! Osmo is part of what you’re calling a digi-physical experience. How important was it for you to look beyond the digital world when developing this product? We realized the importance of a digi-physical experience when we noticed children getting sucked into the world of technology and disengaging from the world around them. By moving the play outside of the screen, Osmo brings kids back into the real world of play where they can collaborate and use physical objects while still using the technology that they love. This is obviously a great gift for parents to get their kids. But are there other places you see Osmo having an impact? 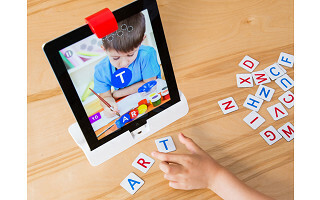 Osmo is a natural fit for teachers because it adds a small but powerful layer of technology on top of a platform, the iPad, which children already know and love. What is the age range that is program works for? My son is 8 and in the third grade, will it help him? Also does it work on all versions of the Ipad? Osmo works with all iPads except for the 1st generations. This is due to the fact that Osmo does need use of the camera. I can vouch for this. I'm 37 and, at the highest level of difficulty, the Tangram puzzles are extremely challenging for me. That's only when I can pry it away from my kids. And that sounds difficult in its own right based on how much you said they love it, Niclas! Thanks again for a great testimonial! Hi, just wanted to confirm. Will it also work on the iPad mini's? I've had Osmo for over 6 months so far and my 4 year old son and 5 year old daughter LOVE it. The literally beg me to let them play it. I'm fighting the ever increasingly difficult love-hate relationship with technology's influence on my kids and Osmo has helped me keep them at least rooted in the real world while understanding that embracing technology is simply the direction things are going in. My wife took Osmo into my daughter's pre-k class earlier this year and the kids (4-5) loved it. We will be taking it into her kindergarten class as well soon and expect similar results. I loved it so much that I bought another one for my 3 year old nephew. Obviously a 3 year old vs a 5 year old vs a 10 year old, will all have different experiences with the different activities... but a 3 year old is entirely capable of playing with the Tangram puzzles and my nephew loves it. This is a must-buy for any parent of young children that owns an iPad. Heck... I'd say it's good enough that it's worth going out and getting an iPad just for this. Hi Niclas! Thank you so much for your testimonial. It brought a huge smile to my face and I will be sure to share your comment with our team! Thank you for your support! You're most welcome! The ONLY change I'd even suggest is making the base and mirror adjustable to accommodate different cases. I've got my wife's iPad in a Lifeproof case that is fairly "5 year old proof". And it's always a little scary taking the case off to let my kids play Osmo. Our current "workaround" is a combination of "OSMO STAYS ON THE TABLE!" along with parental participation (which should be part of any educational system with your kids anyways). So it's by no means a complaint. Just a suggestion for future consideration. Especially due to it's excellent application for use in classrooms with 20+ kids clamoring to get their hands on it. A great idea, Niclas! I'm sure Erica and co. will be bouncing that idea around some time soon! We have had a couple people reach out with the same suggestion. We are hopeful that in the future we will be able to have Osmo work with cases. I would also love to vouch for this product! We were in the first few deliveries of this wonderful play set! I have children now ages 6-12. They all LOVE it! From the tangram, to the word play and now the Masterpiece drawing! We all cannot get enough of it. I ALSO took it into my son's pre-K class and his teacher LOVED it and wanted to get one for the class. She thought it was very smart! When placing an order, is it for the Starter Kit or the Creative Kit? The apps themselves (Software) is available in the App Store free of charge. If you want to play all 4 games then you'll need to purchase the Starter Kit. If you're only interested in Masterpiece and/or Newton then the Creative Kit would work for you. I LOVE this. What a neat, creative idea not only to so kids don't get "MUSH BRAIN" from watching senseless TV, but this gives them a leg up on the workings of iPads and technology - because schools are now using them at such an early age. Now you just need to develop games for us OLDER FOLKS ... Because we need to keep our brains active too! ???? We have actually had many parents reach out and provide testimonials saying that Osmo has not only been great for their children but also grandparents. People are using it to help keep their mind sharp as well as help with memory. Hi Erica! Any plans to expand to Kindle fire or other android devices? I was thinking the same thing, plus will there be a SDK made available? I can see many teaching application that can be used with this technology. We currently don't offer 3rd party API. We are still a very small company and not quite ready for it. Sorry, for the moment, Osmo is compatible only with iPad and we have no immediate plans to adapt it to Android or the Kindle fire. it looks like this is only for teaching with the english alphabet correct? Is there any way to customize for teaching Cyrillic? Right now Osmo is currently only available in English and French, but we are planning on branching out to other languages further down the line. You can use myOsmo at my.playosmo.com to customize the Words albums. You can upload your own pictures and words in the language of your choice as long as you use the English alphabet. Are the letter tiles offered in lower case? Hi Carol, thanks for the question! No, the letters are all in the same uppercase font. Too much screen time is a constant worry, especially if you have kids. 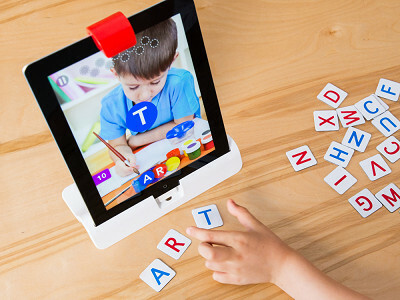 Osmo is a groundbreaking way to blend digital learning with the physical world. Via a special reflector that you place over your iPad’s camera, Osmo sees what’s happening in front of it. This bridges kids’ real-world actions with games that they can play solo or in groups. Make a shape with Tangram puzzle pieces and Osmo will celebrate when you get it right. Have a word-guessing competition with real-life tiles. Let Osmo help you draw any picture by turning photos into a set of lines for you to trace on paper. Even learn some physics by using anything—a pen, a toy, a pair of glasses—to guide balls on the screen into targeted zones. Founders Pramod Sharma and Jérôme Scholler are two dads who used to work at Google. They wanted their kids to embrace technology, but in a way that fosters creative thinking and interacts with the real world. Osmo’s games all work with free apps, and the physical pieces (for Tangrams and Word games) are included. As Osmo continues to grow, they’ll be adding new apps, too.